Hi! I’ve recently installed two units. They have run well until 2019-04-03T00:00:00+10:00 when samples were regularly lost. This occurred in the on-board logs and the influx database. I think the unit was trying and failing to download 02_04_00, which maybe took up too many resources? I solved this by changing update class to “None” and restarting. This has fixed the problem. I have many other IotaWatts and only these two have a problem. The WiFi is crappy for these two. I don’t need any “fix”, but thought I’d let you know. See attached for the logs. I’ve removed repeated errors. 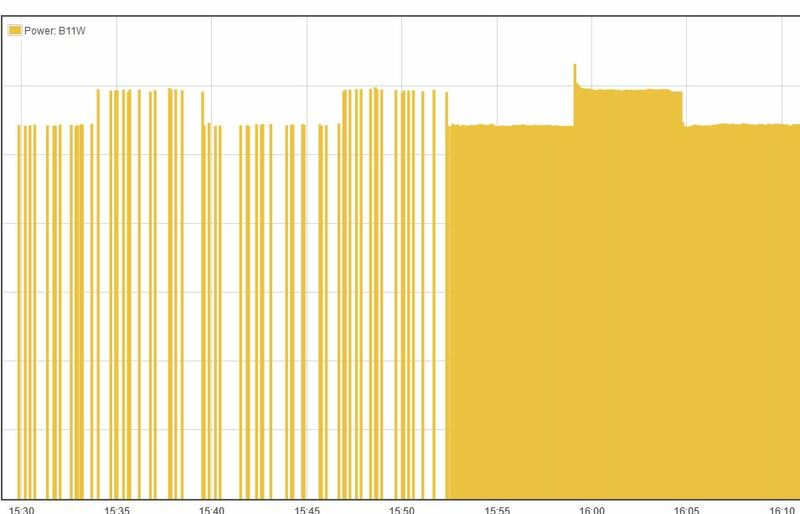 See attached for the before (intermittent data recorded) and after the restart (10s data recorded). Thanks for the heads up. The new release download usually takes about 5 seconds in North America where the server is located. The IoTaWatt blocks for the entire time. This is not supposed to be a frequent event. I took a look at the code, and will change it to increase the time between attempts after several consecutive failures. Maybe go every hour, then once a day. Need to understand the failure mode better to decide that. Since you have more IoTaWatt installed, would it be possible to take a look at how the others handled that download and how long it took? They should have all been around the same time on the same day. I’m curious if this is an Australia problem or a local internet connection problem. The WiFi signal strength for this unit doesn’t look that bad. There is a bit of a catch-22 here when I make this change, as you will need to update the units to get the change. All ten other units are reporting fine. I’ve checked one log - see below - showing the update. Simple setup, only a few circuits each. WiFi network is known as “crappy” - this is just from the users. The signal strength is ok. I think they refer to dropout, reboots. I had no problems on site with a mobile (“cell”) phone and a laptop. Since the units behaved the same, I assume it’s a WiFi - related problem. Upstream of the WiFi, it’s a council (i.e. city government) site before the internet, which may have firewalls / filtering / etc. Maybe the download URL is blocked? I’ll be on site again in the coming weeks and am happy to run any tests. 4/03/19 00:33:45 Firmware updated, restarting. 4/02/19 14:33:55z Updater: Installation complete. 4/03/19 00:33:56 timeSync: service started. 4/03/19 00:33:57 dataLog: service started. 4/03/19 00:33:57 historyLog: service started. 4/03/19 00:33:58 Updater: Auto-update is current for class MINOR. Even the successful download was 33 seconds, which is a constant problem with internet down there. I’m thinking the problem here is the internet link and not the WiFi. If cellular works ok there, it might work to do a hotspot with a phone to update the firmware. It’s a pita to switch networks and then back, but maybe the only way to get there. If you decide to do that, remember that the passwords for the AP mode will be the new device names. Fortunately this is a temporary install, so turning off the updates for the duration (a few months) is not a problem. If it’s helpful, I’ll try accessing http://iotawatt.com/firmware/iotaupdt.php from a laptop connected to that network next time I’m there, to simulate an update request. That’s probably not going to provide much information. iotaupdt.php is just a script that responds to the iotawatt’s query about the latest release version for it’s auto-update class. Just accessing it is a single HTTP transaction, and without the HTTP headers that are part of that, it will respond with 403 anyway.